Modern printers are much smarter than the original printing devices they were like, say, 10 years ago. Aside from just printing, they can scan, copy, send faxes, automatically connect to the Web for software updates, and so on. The only thing printer couldn’t do was translation. Not until now. Fuji Xerox Corporation developed a technology that enables laser printers and copiers to translate the text to be printed. The idea behind the technology is simple — the printer scans a sheet of text, and then connects to a dedicated server on the internet where the text is translated and sent back to printer for output. The translating algorithms on the server can distinguish between text, drawings and lines, so page layouts remain. So far, only four languages are available for translation: Japanese, Chinese, Korean and English. The laser printer is still a prototype and the technology will take time be refined to be ready for market. No information is yet available as for the quality of the translation, hopefully it will be better than that of Babel Fish or Google Translate. This entry was posted on Monday, September 24th, 2007 at 4:32 am	and is filed under innovation, laser, printer, technology, Xerox. 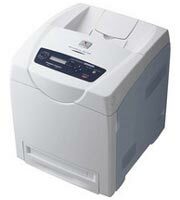 "Mitsubishi Introduces New Photo Printer"
"Epson Unveiled New Higher Speed Inkjet Printers"